This hospital is situated in the heart of the city, 18kms away from the Chennai airport and 5kms away from the Chennai central railway station. All the rooms in this hospital are Air Conditioned. Browsing facilities provide in the hospital. Treatment program for 4 - 5 weeks will be better accepted in the body while it is taken under rest. Some of the programs may be general and during that period you will be able to move out. Basic treatment schedule will be 1 to one and half hrs during day, timings may change according to the change of treatment. We will arrange for your pick up from the airport on prior information. 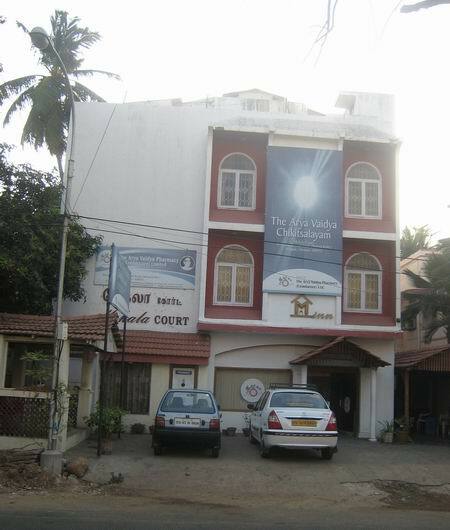 The treatments offered by this centre are; Basti Karma, Virchana Karma, Vamana Karma, Nasya Karma, Rakta Moksha Karma, Pizzichil, Netra Tarpana, Shirodharra, Localized Bastis and also offers Abhyangam, Navarakizhi, Elakizhi, Podikizhi, Snehapanam, Nasyam, Kadivasthi, Lepam, Upanaham. We provide very blank vegetarian food, rice with vegetables. We have normal room with 2 beds, suite, all the rooms have A/c, TV, Intercom facilities. We usually recommend 3 weeks of comfortable stay, the cost of this course is Rs.50000/-inclusive of food & accommodation. There is no air & noise pollution in the surrounding area. The vaastu of land and building is good. The information provided by Dr.K.T.Jayakrishnan. Address: 18 A, Manikeswari Road, Kilpauk, Chennai – 600010, Tamilnadu. Highly recommended for outpatient management, the facilities are simple and not ideal for healing. Due to the expertise of the senior doctor, patients come from all over India to seek his Guidance. Highly recommended for outpatient management, the facilities ..